Highly accomplished photographer Joel Meyerowitz has compiled a graphic account of the horrors and triumphs of Ground Zero, once home of the mighty World Trade Center towers. As the area was a crime scene, no one was permitted in, let alone to take photographs. Meyerowitz was eventually granted continued access to the area and has put together this astonishingly beautiful book. 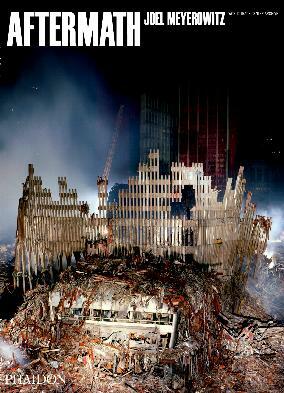 The horror and carnage by the sheer act of barbarism was, and is, palpable in these photographs. 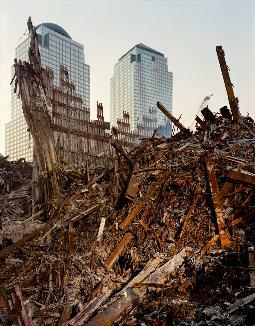 Meyerowitz provides a commentary for his pictorial diary of the nine months he spent recording Ground Zero for generations to come. The photographs are both phenomenal yet disturbing, as there hasn't been so much detail in print before. Many photographs are grim reminders of that fateful day, many were beautiful in their own special way, and many moved me to tears. The growing grass on page 337 was one. Another picture that got to me was the lower one on page 64 - you can see computer monitors on desks where, no doubt, people were sitting at the time of the collapse. Meyerowitz dedicates this book to those who were there. I recall visiting Ground Zero in November 2001 and also listening through the night to the ongoing work from where I stayed on Bleecker Street. It was very emotional and moving. Pictures used with permission by Phaidon.